Dental implants are a treatment used to replace missing teeth, providing you with a revolutionary alternative to traditional dentures and bridges. With this treatment, small titanium posts are surgically placed right into your jawbone. Your bone fuses to these posts, a natural process known as osseointegration. This process stabilizes the posts in your jaw. They essentially become strong roots that hold your new teeth securely in place. At Arrowhead Oral and Maxillofacial Surgery, we are proud to offer dental implants for your tooth replacement needs. 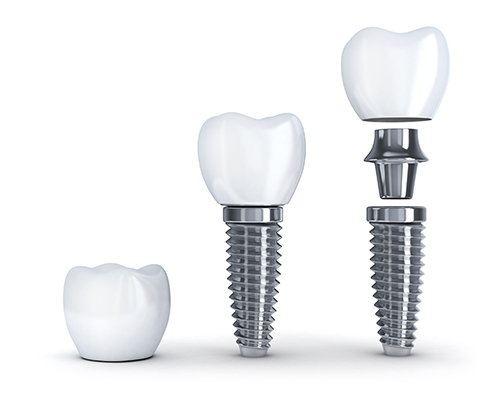 Dental implants are often thought to be a modern development. The truth, however, is that they have a rather long history, going back thousands of years. Dental implants have a very long history that spans thousands of years. They have also been used in cultures around the world. The earliest implants were placed after death, as a way of restoring the body and preparing it for the afterlife. One of the most interesting discoveries came in 1931. An archaeologist found the mandible of a young Mayan woman, dating back to 600 AD, which had an implant made of bits of shells and carved bone. Originally, it was believed to be placed after death, just like other implants. However, in 1970, it was discovered that her bone had begun to fuse to the implant. This incredible discovery showed that it had instead been placed in her jaw while she was still alive. The implants that we use today are the result of a discovery made in the 1950s. In the early 50s, a Swedish orthopedic surgeon by the name of Per-Ingvar Brånemark was doing research on how bones heal. During his research, he placed a titanium cylinder into the femur of a rabbit. At a later date, he tried to remove it only to find out that the bone had fused to the cylinder, making it irremovable. Brånemark had accidentally discovered osseointegration. Intrigued by what he had found, Brånemark decided to look into this natural phenomenon more. He dove into research, using both animal and human subjects. Eventually, he created dental implants, which he placed successfully for the first time in 1965. He continued his work on dental implants, performing more research and development. He partnered with Bofors AB, which is now Nobel Industries, a company that helped him to both develop and market his products. Later, Bofors AB created Nobelpharma, now Nobel Biocare, a company that focused solely on dental implants. Today, Nobel Biocare is the industry leader in dental implants, and over 7 million Brånemark systems have been placed. Over the years, dental implants have undergone numerous changes and new developments, all designed to improve their stability and their reliability. They have also become more widely available to more patients. Many of those who may have been considered ineligible a few decades ago now have options. There is also current research into different materials that can provide the same results as titanium, with the goal to make implants available to patients who cannot, or do not, want to use metal. Dental implants provide you with an excellent way to restore the functions of your missing teeth and the appearance of your smile. They also help to protect the health and integrity of your jawbone, a benefit no other tooth replacement option offers. For more information on dental implants, and to find out if they are right for you, call Arrowhead Oral and Maxillofacial Surgery at (623) 738-2564 today.